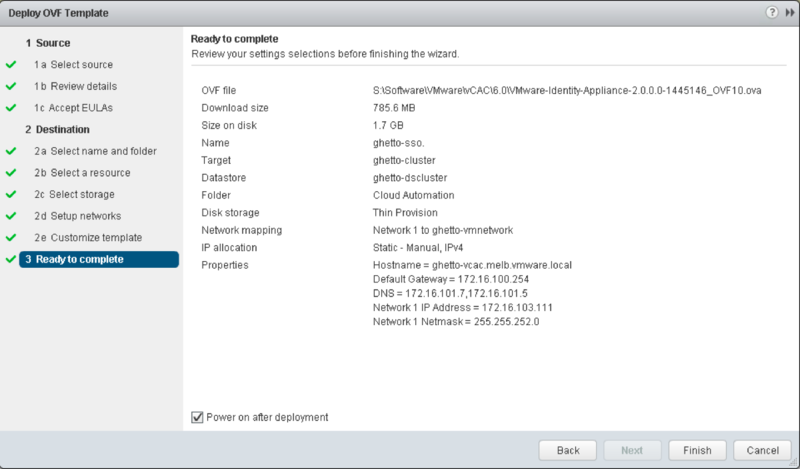 Download the vCloud Automation Center Identity Appliance from My VMware. 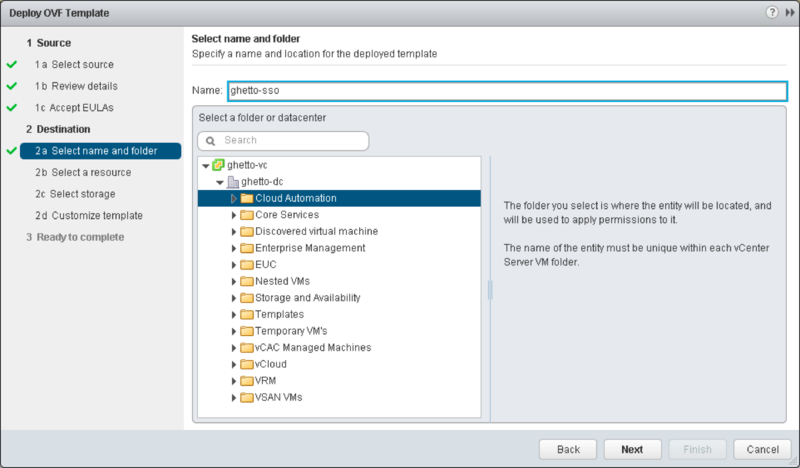 Download the vCloud Automation Center Appliance from My VMware. Click the “Local File” radio button and then click Browse. Navigate to the location you have saved your vCAC Identity Appliance, select the OVA file and click Open. Review the details provided and then click Next. 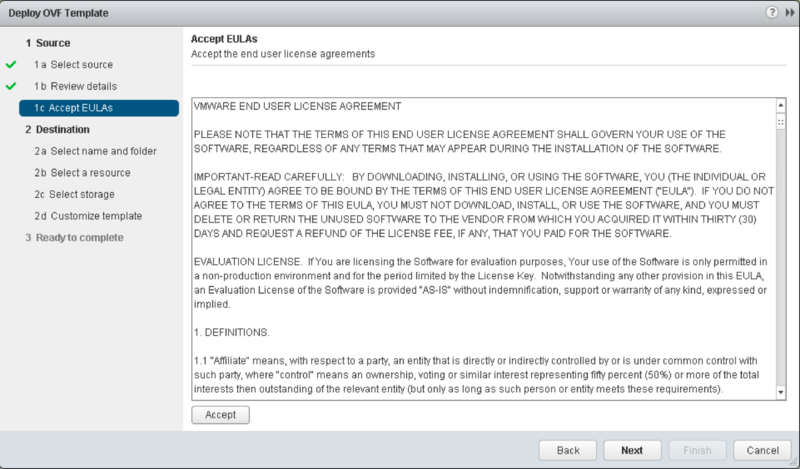 To accept the EULA, click Accept and then click Next. 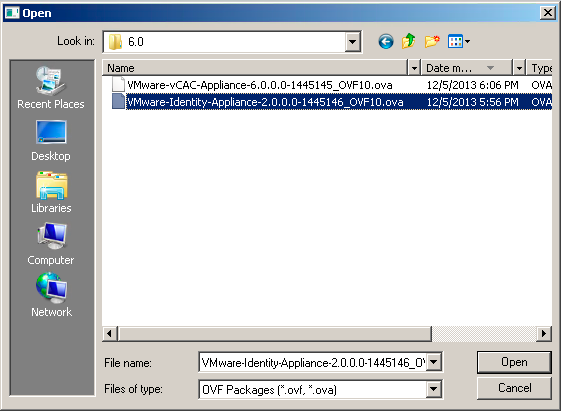 Enter a name for your vCAC Identity Appliance and select a Folder or Datacenter in which to place it and click Next. 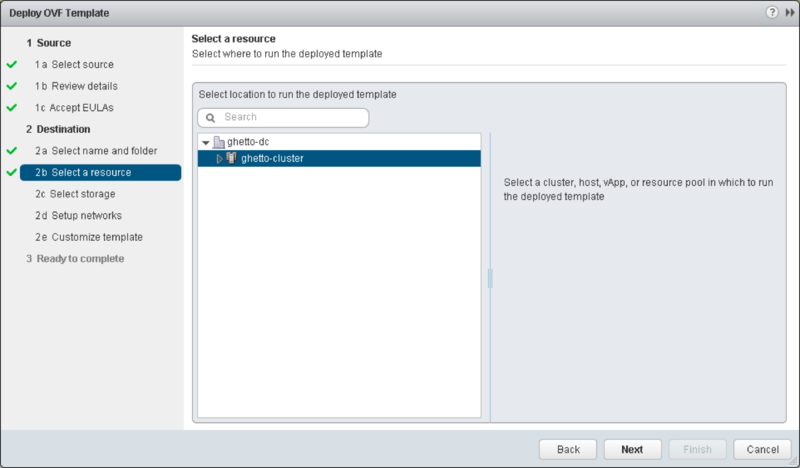 Select a Cluster, Host or Resource Pool where you want the vCAC Identity Appliance to run and click Next. 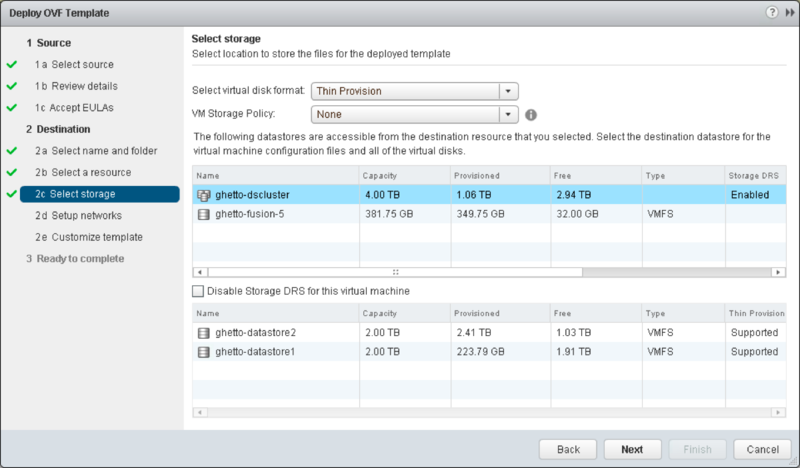 Select a Virtual Disk Format, and a VM Storage Policy if these are configured in your environment. Select a Datastore Cluster or Datastore where you want your vCAC Identity Appliance to be stored and click Next. Select the appropriate Port Group from the drop down list to attach the vCAC Identity Appliance to and click Next. NOTE: IPv6 is not supported on the vCAC Appliances, so do not change the default IPv4 drop down box value. Enter a password for the root account. This will be used when logging into the VAMI. Enter your hostname. It is strongly recommended that you enter the FQDN of the appliance in this field. Enter your Default Gateway, DNS Servers (values separated by commas), IP address and Subnet Mask and click Next. Tick the Power on after deployment checkbox and click Next. Repeat steps 4-18 for the vCloud Automation Center Appliance. Login to your DNS Server and launch the DNS Management console. 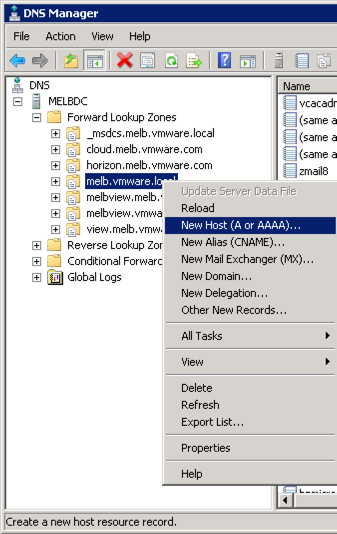 Navigate to the appropriate forward lookup zone, right click on it and select New Host (A or AAAA). 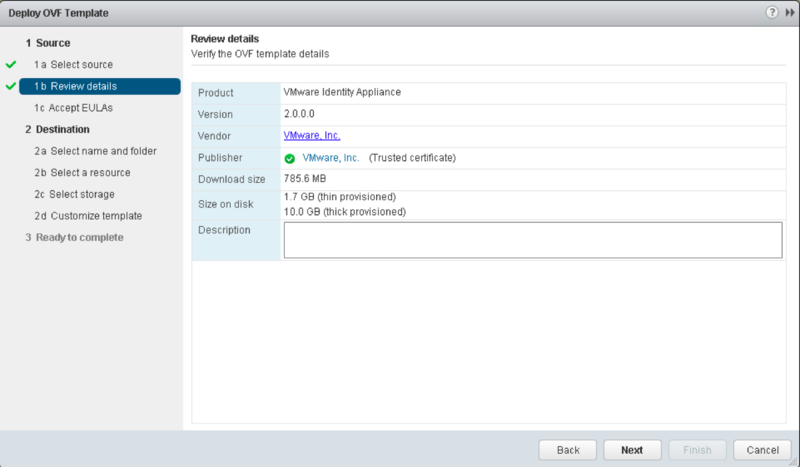 Enter the name of your vCAC Identity Appliance minus the domain suffix. 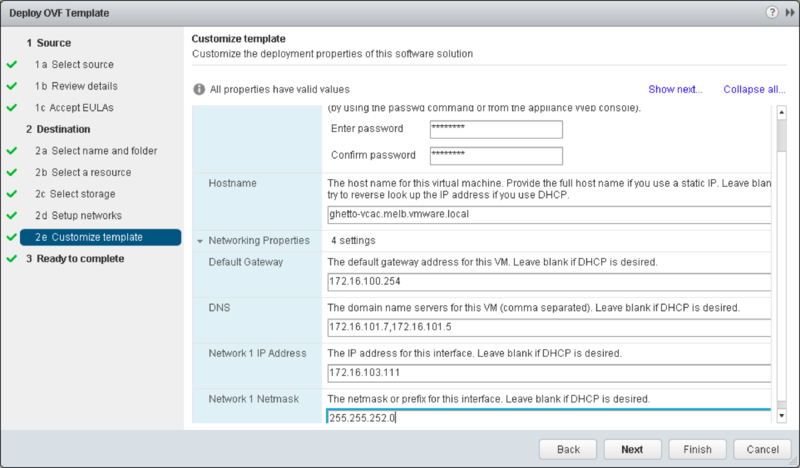 Enter the IP Address of your vCAC Identity Appliance. 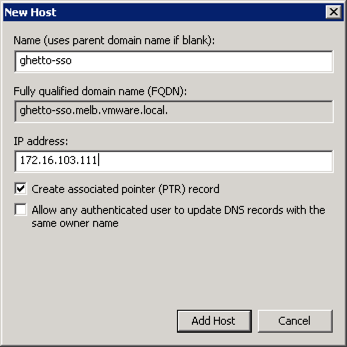 Note: Ensure that the tick box for “Create Associated Pointer (PTR) Record” is checked. 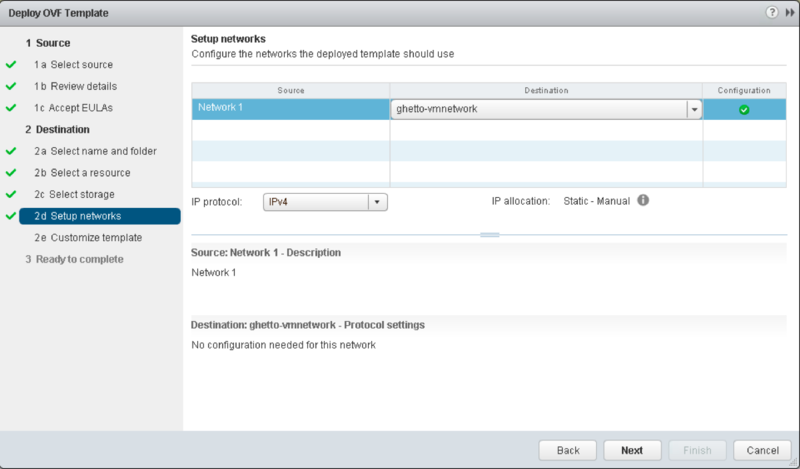 Repeat steps 2-5 for your vCloud Automation Center Appliance.